An electric skateboard may initially seem like a novel and somewhat unnecessary concept (we were born with legs, after all), but in a world where parking space is as scarce as trustworthy politicians and the need for economical and efficient travel is becoming more and more important, a battery-powered board begins sounding like an extremely attractive prospect. Not to mention it gets the 10-year-olds inside of us more excited than the day we found out about dinosaurs. 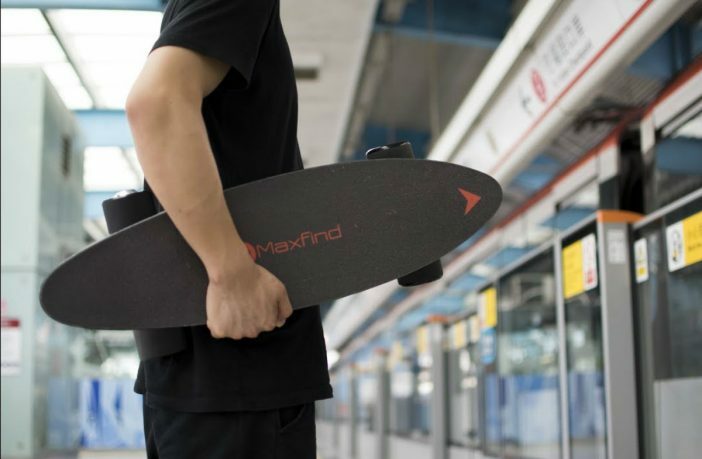 So, we got our hands on Maxfind’s Max C electric skateboard to find out if the hype behind the wheels is worth getting on-board with. Powered by a high-performance brushless hub motor, the Max C is a smaller, easier to charge, and ‘simpler’ board amongst the electric skateboards in the market. In addition to featuring a Samsung 18650-sized cell (which is used by Tesla and other electric vehicles), the board is also IP65 water & dust proof, meaning that you don’t need to worry about South Africa’s unpredictable weather and roads when riding the board. While electric skateboards are a great idea for inner-city or suburban traversal, there’s one thing that most don’t think of: the weight. Battery-powered skateboards, by design, are quite heavy, but the Max C takes a more ‘portable’ approach to having an e-board, weighing in at just under 4kgs, allowing you to carry it into a store, elevator and anywhere else where a longer, heavier board may seem a bit cumbersome; you could even strap it to your backpack. As for it’s performance, with a single hub-motor on the left back wheel, the board hits speeds of about 15 km/h, which is more than fast enough to get you where you need to go. It has a weight limit of 80kgs, although friends of mine who exceed that were able to ride the Max C around without a hiccup. And as for hills, it’s not going to climb a steep driveway, but can easily handle an incline up to about 15 degrees. It charges relatively quickly (2 hours) and lasts around a full day of rigorous use, and the control (which is a blatant clone of a Wii nun-chuck) is a big step up from the simplistic controllers found on other boards. It’s a great option for those looking for an e-board that delivers the experience without the weight and length of other products on the market. If you’re looking for more deals and prices on electric skateboards, check out PriceCheck’s list of offerings.